Mentoring is an effective way to enhance professional development for anyone new to Pediatric Gastroenterology or looking to change to a new subspecialty within Pediatric Gastroenterology. This is accomplished through sharing experience, expertise and knowledge. A successful mentoring relationship is built upon effective communication, respect and trust between the mentor and mentee. Benefits of having a mentor include: Advice on developing strengths; exposure to new ideas; guidance on professional development and career advancement; opportunities to develop new skills and knowledge; increased visibility and recognition; opportunities to learn more about projects and professional opportunities. Benefits of being a mentor include: Recognition as an expert and leader; personal development of leadership and coaching styles; exposure to new idea’s; personal satisfaction of helping others; recognition by employer as going above and beyond the job description. APGNN has started piloting a professional mentoring program. Based upon the input from those involved we plan to expand this to the entire membership by the second half of 2018. They new member application now asks if the applicant would like to be assigned a mentor. Mentors will be offered for general professional development needs as well as for subspecialties. If you are interested in learning more about this program, please refer to the PDF link at the bottom of this page. NASPGHAN and the NASPGHAN Foundation, in collaboration with the Crohn's & Colitis Foundation, announce the launch of a new mobile app, Doc4me, to improve the process of IBD transition. 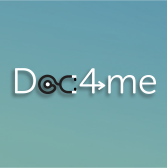 Doc4me helps find physicians to transition to based on the patients' locale or designated area and other parameters. It provides resources on what patients need to know and do prior to their appointment with their new doctor. In addition, there is a transition checklist to help them attain the necessary skills to transition well. Moreover, Doc4me provides information about medications, nutrition and living with IBD. Please help us promote the app to your patients, families and colleagues. To download a patient handout, office poster or web banner ad click here.To download Doc4me in both IOS and Android formats, please go to the App Store and Play Store. To learn more please go to www.doc4me-app.com or for inquiries please contact doc4me@naspghan.org. Clinical Handbook of Pediatric Gastroenterology (Second Edition) : We are working on the third edition and are not printing any more 2nd editions. 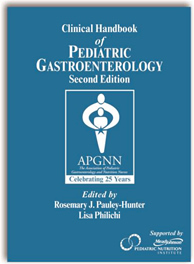 Clinical Handbook of Pediatric Gastroenterology, Second Edition is a pocket handbook written to meet the needs of both newcomers as well as veteran providers of children with gastroenterology and nutritional problems. This new edition has been carefully reviewed and fully updated to reflect the latest clinical information for care providers of children with gastroenterology and nutrition issues. Composed of 21 chapters, the initial chapters address the more common conditions seen in patients and are organized in a framework designed to provide key assessment features, diagnostic tools, and treatment options. Clinical pearls and key resources draw on the practical experience of our contributing authors, who are nursing experts in their specialty areas. The final chapters present key background information on diagnostic studies, medications, and nutritional aspects that provide a basis for the therapies used in the practice of pediatric gastroenterology. Written especially for care providers of children with gastroenterology and nutrition issues. Pocket sized for handy reference. Presented in table formats to make the essential information easy to find and easy to read. Provides clear and detailed key assessment features, diagnostic tools, and treatment options. Clinical pearls and updated key resources from nursing experts in their specialty areas. The latest clinical information on diagnostic studies, medications, nonpharmacologic, and nutritional aspects of therapies. In addition, you can obtain the pdf files from the lectures, receive MOC part 2 and CME credit and listen to questions and answers related to each topic. Purchase now!